Join Us in Remembering The Early Days of Air Travel. Co-written by Airlineratings.com founder, Geoffrey Thomas. your username Username is a type of an unique information which we use to identify you in the website. UK ePassport gates open soon to 6m additional visitors. Love Switzerland and the DC-3? Then you will love this! 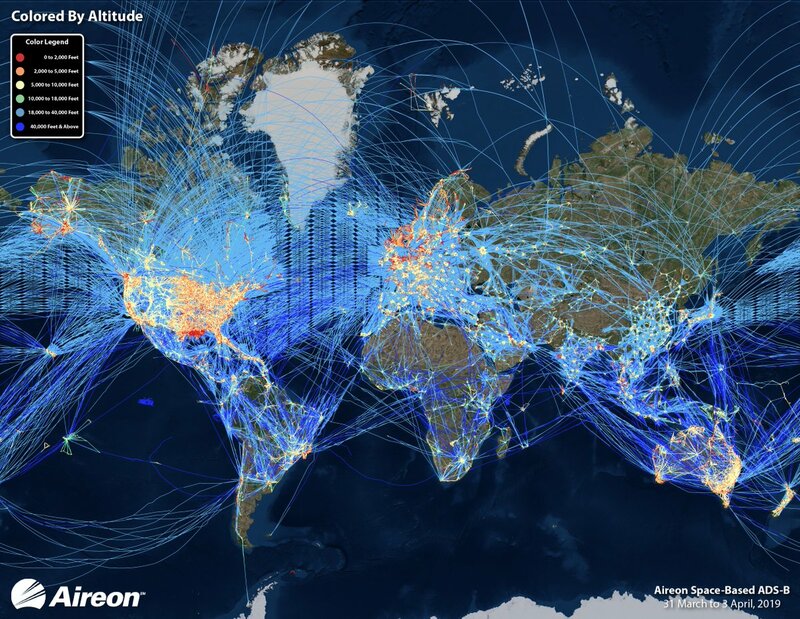 Aircraft tracking company Aireon has demonstrated the reach of aviation in the 21st century with a spectacular visualization of aircraft it tracked across the globe using its now operational space-based system. The visualization is based on Automatic Dependent Surveillance-Broadcast (ADS-B) data captured by 66 Aireon payloads housed on the constellation of IridiumNEXT satellites from March 31 to April 3. It shows planes traveling across the North Pole and as far south as Antarctica with major population centers a blaze of color. The tracking system, which went live earlier this month after 130 billion ADS-B position reports were tested and validated, means aircraft can be tracked in real time no matter where they are in the world. Read: US Airline quality ratings hit a 29-year high. It was Aireon that provided the refined data that prompted US and Canadian authorities to ground the Boeing 737 MAX after a fatal March 10 crash in Ethiopia. It will help minimize the chances of another airliner disappearing in the way Malaysia Airlines MH370 did and help provide additional insights into aircraft accidents. NAV Canada and the UK’s NATS are the first air traffic control providers to use the tracking service and predict it will reduce overall flight safety risks by about 76 percent. They are also among a group of investors backing Aireon. ADS-B is already used in conjunction with ground stations and relies on aircraft broadcasting every half second their identity, a precise Global Positioning System (GPS) location and other information such as altitude, heading and speed. Aireon takes that a step further by using the Iridium NEXT satellite constellation to provide full, continuous air traffic surveillance across the globe. The globe-spanning technology compares with coverage by conventional ground-based systems of about 30 percent of the Earth’s surface and position updates every 10 to 14 minutes. It will allow airlines to boost the number of available “user preferred” routes that allow them to take better advantage of favorable winds and avoid bad weather. NATS and the International Civil Aviation Organisation estimate that being able to safely fly more direct oceanic routes at optimal speeds and altitudes will save airlines more than $US300 per flight across the Atlantic. That’s expected to translate into a reduction in CO2 emissions of two tonnes per flight.